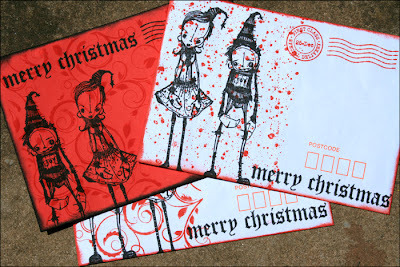 My Creative Existence: Creepy Christmas Mail Art. Okay - I promised you some more Mail Art - so here it is! I used 2 of the same envelopes as in the last post, plus a plain red envelope for maximum impact! I used the Darkroom Door Flourish and Splatter background stamps, as well as some stamps from the DD "Christmas Reindeer" set. 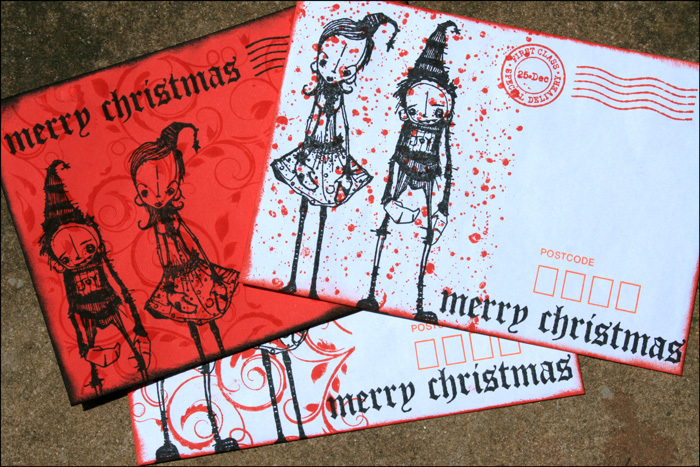 The creepy Christmas couple are stamps from Stampotique, and the "Merry Christmas" is a stamp that I've had in my stash for ages from OBP. The inks used were Barn Door Distress ink and just a normal black ink. The edges of the envelopes were inked with a sponge. I hope they don't freak out the postie! LOL!! LOL - freak out the postie! These might frighten my postie to actually put letters INTO the mailbox instead of leaving them hanging out. Last minute Christmas card ideas! Skywatch Friday - 17th December 2010. Some More Christmas Mail Art! A Christmas decoration from the archives!